Wow, yesterday was all about surprise releases in the world of designer art toys! For example, Reis O’Brien and Bimtoy surprised their fans with the release of not one but two awesome new Tiny Ghost colorways. The icy hands of winter reach out to us all, but it’s the freezing grasp of the Silver Specter Tiny Ghost that chills you to the bone! A spirit of frost and cold, of dripping chill rain and slicing wind. The Silver Specter’s merest touch makes you thankful for the warmth of home. 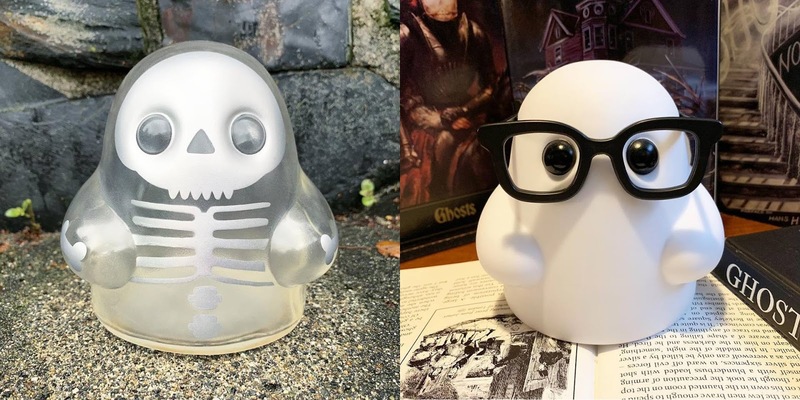 If he ever lets you return home… Produced by Bottleneck Gallery, The Silver Specter Tiny Ghost features translucent clear vinyl with silver details. It stands 5” tall, is limited to 400 pieces and retailed for just $30 at the Bimtoy online store. The Nerdy Ghost is the nerdiest ghost in Creepy Hollow, and just happens to be Tiny Ghost’s best friend! The kind of ghost that always has his nose in a book, Nerdy Ghost isn’t one for the rattling of chains and disembodied moans in the night. But if you every think you hear the soft phantom flipping of pages coming from your library late at night, you’ll know that Nerdy Ghost is paying you a visit! The Nerdy Ghost vinyl figure stands 5” tall and retailed for $25. Unfortunately, both spooky colorways sold out almost immediately upon release.